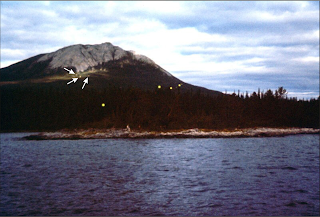 Earthquake lights (EQL) photographed in Tagish Lake, Yukon-Alaska border region. Lights were estimated at 1 meter in diameter with the closest orbs slowly drifting up the mountain to join the more distant ones. A study suggests that earthquake lights (EQL) have a higher probability of occurring on or near rift environments where subvertical faults allow stress-induced electrical currents to flow rapidly to the surface. Earthquake lights are mysterious lights that appear before or during an earthquake. They appear in different shapes and forms such as spheres of light floating through the air (as imaged on the left), high flames of light, multi-colored globes of light moving through the sky, or just streams of light running along the ground. Earthquake lights are rarely seen after an earthquake. This suggests that the nature of these lights could be based on the stress mechanics exerted on the faults during an earthquake. Of the documented occurrences of earthquake lights, the study shows that 97% of these have been associated with rift environments. A rift is a linear zone where the Earth's crust and the hard and rigid outer layer of the Earth, called the lithosphere, are being pulled apart. This forms an extensive system of fractures and faults. Only 5% of seismic activity are associated with this type of intraplate seismic activity which also can explain the rare occurence of earthquake lights. Rare earthquake lights are more likely to occur on or near rift environments, where subvertical faults allow stress-induced electrical currents to flow rapidly to the surface, according to a new study published in the Jan./Feb. issue of Seismological Research Letters. From the early days of seismology, the luminous phenomena associated with some earthquakes have intrigued scholars. Earthquake lights (EQL) appear before or during earthquakes, but rarely after. EQL take a variety of forms, including spheres of light floating through the air. Seconds before the 2009 L'Aquila, Italy earthquake struck, pedestrians saw 10-centimeter high flames of light flickering above the stone-paved Francesco Crispi Avenue in the town's historical city center. On Nov. 12, 1988, a bright purple-pink globe of light moved through the sky along the St. Lawrence River near the city of Quebec, 11 days before a powerful quake. And in 1906, about 100 km northwest of San Francisco, a couple saw streams of light running along the ground two nights preceding that region's great earthquake. Continental rift environments now appear to be the common factor associated with EQL. In a detailed study of 65 documented EQL cases since 1600 A.D., 85 percent appeared spatially on or near rifts, and 97 percent appeared adjacent to subvertical faults (a rift, a graben, strike-slip or transform fault). Intraplate faults are associated with just 5 percent of Earth's seismic activity, but 97 percent of documented cases of earthquake lights. "The numbers are striking and unexpected," said Robert Thériault, a geologist with the Ministère des Ressources Naturelles of Québec, who, along with colleagues, culled centuries of literature references, limiting the cases in this study to 65 of the best-documented events in the Americas and Europe. "We don't know quite yet why more earthquake light events are related to rift environments than other types of faults," said Thériault, "but unlike other faults that may dip at a 30-35 degree angle, such as in subduction zones, subvertical faults characterize the rift environments in these cases." Two of the 65 EQL events are associated with subduction zones, but Thériault suggests there may be an unknown subvertical fault present. "We may not know the fault distribution beneath the ground," said Thériault. "We have some idea of surface structures, but sedimentary layers or water may obscure the underlying fault structure." While the 65 earthquakes ranged in magnitude, from M 3.6 to 9.2, 80 percent were greater than M 5.0. The EQL varied in shape and extent, though most commonly appeared as globular luminous masses, either stationary or moving, as atmospheric illuminations or as flame-like luminosities issuing from the ground. Timing and distance to the epicenter vary widely. Most EQL are seen before and/or during an earthquake, but rarely after, suggesting to the authors that the processes responsible for EQL formation are related to a rapid build-up of stress prior to fault rupture and rapid local stress changes during the propagation of the seismic waves. Stress-activated mobile electronic charge carriers, termed positive holes, flow swiftly along stress gradients. Upon reaching the surface, they ionize air molecules and generate the observed luminosities. Eyewitness reports and security cameras captured a large number of light flashes during the 2007 Pisco, Peru M 8.0 earthquake. Together with seismic records obtained on a local university campus, the automatic security camera records allow for an exact timing and location of light flashes that illuminated a large portion of the night sky. The light flashes identified as EQL coincided with the passage of the seismic waves. See embedded video above. Thériault likes the account of a local L'Aquila resident, who, after seeing flashes of light from inside his home two hours before the main shock, rushed his family outside to safety. "It's one of the very few documented accounts of someone acting on the presence of earthquake lights," said Thériault. "Earthquake lights as a pre-earthquake phenomenon, in combination with other types of parameters that vary prior to seismic activity, may one day help forecast the approach of a major quake," said Thériault.